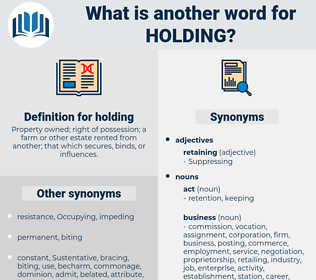 What is another word for holding? Property owned; right of possession; a farm or other estate rented from another; that which secures, binds, or influences. prisoners, owners, opens, estimates, discuss, held, Veterans, possesses, retention. discussions, Hearings, preparations, elections, organizers, celebrations, arrangements, purposes, observances, actions, Conferences, Ceremonies, procedures, ministers, exchanges, structures, games, seminars, contracts, uniforms, venues, inmates, Workshops, Measures, auspices, events, defects, reviews, Cities, books, Eras, decades, dates, opens, held, Organizations, organisations. held, Carrying, taking, welcoming, conglomerate, launching, filing, scheduling, bearing, solemnization, retention. approximately, hailing, demonstrating, honouring, concluding, catching, Administering, Considering, Negotiating, Consolidating, Introducing, Constituting, Discussing, employment, accommodating, Shouldering, Suggesting, Adhering, Occupying, Acknowledging, Apprehending, Imprisoning, Confiscating, restructuring, Declaring, following, Obtaining, Accomplishing, reorganizing, representing, Exploring, Prosecuting, assembling, Guaranteeing, contain, Activities, Advocating, Describing, existing, commemorating, Originating, Adopting, investigating, Hoping, Commenced, Commencing, Dismissing, impeding, belonging, acquiring, observing, Tolerating, streamlining, contending, incumbents, defending, elections, Deeming, Capitalizing, Initiating, uploading, imposing, compiling, leaving, assuming, accountability, Disposing, Delaying, Displaying, Enjoying, identifying, Enforcing, Anticipating, hiding, Undergoing, Removing, feeling, Sheltering, Choosing, Authorizing, Devoting, Comprising, indonesia, Embodying, Employing, protecting, Outlining, slowing, Anchoring, coordinating, unlocking, guarding, updating, Inhabiting, Applauding, working, Estimating, confining, Discharging, believing, issuing, Experiencing, rendering, Stipulating, commissioning, shooting, Producing, qualifying, directory, Deducting, rotating, threatening, Exerting, deciding, pushing, showing, encompassing, Clutching, confirming, hindering, compelling, detailing, Indicating, Preparing, asserting, Alleging, Deposited, Selecting, Residing, Applying, Managing, precisely, Addressing, Practising, starting, mother, seizing, Including, obliging, pursuing, Attaching, Clamping, Preventing, Commending, clustering, halting, Charging, Exhibiting, Forcing, harbouring, dealing, attending, political, reporting, Facilitating, practicing, Endorsing, repeating, supporting, Expecting, Providing, striking, Involving, Interviewing, arguing, Blaming, speaking, designing, Recognizing, laying, Translating, benefiting, Empowering, Soliciting, advancing, shaking, pointing, Achieving, fastening, Presenting, informing, transmitting, Consisting, hammering, Capturing, Behaving, Occurring, reflecting, sanctioning, becoming, Reserving, owing, Instituting, affecting, ending, Harboring, Expressing, Claiming, saving, fighting, pending, Underpinning, Examining, filling, remaining, grasping, sticking, Effecting, namely, balancing, Aggregating, Assessing, Retracting, Throwing, shing, Pertaining, saying, grouping, Affirming, sealing, complying, Lifting, moving, resolving, covering, entering, citizen, hijacking, Utilizing, serving, drawing, thanks, looking, directing, Attaining, playing, punishing, combining, accusing, investing, Pinching, determining, housing, Insuring, leading, offering, Chairing, ensuring, demanding, founding, Submitting, submits, steering, shaping, Acceding, inviting, standing, fostering, dragging, low, Depending, Citing, according, reaching, accepting, joining, Promoting, Clicking, judging, happening, wearing, featuring, sponsoring, Resisting, using, assuring, tackling, posting, Responding, Doing, gripping, pressing, Relating, resulting, heading, awarding, enabling, satisfying, spending, seeking, voting, quartering, Referring, inmates, Respecting, Forming, Arising, living, putting, Tendering, embracing, Earning, Boosting, Phasing, agreeing, booking, buying, caring, viewing, pauses, Allowing, paying, Subjecting, Stemming, curbing, causing, targeting, tapping, till, returning, i.e., letting, eight, focusing, cases, Granting, going, Noting, Aiming, firing, Having, marking, camping, waving, seeing, Assisting, trying, asking, backing, on-line, Stating, Requesting, takes, Pumping, tibet, Resting, C, giving, facing, 3.13, acting, getting, Got, prisoners, staging, Carrying, taking, welcoming, conducting, launching, bring, filing, scheduling, bearing, retention. They sat down side by side, Paul holding his mother's hand in his. Take it, he added with a sigh, holding out the watch.